International Association of Machinists Local 1584 members picket Henkel Aerospace in Bay Point, California, Oct. 21. Workers began strike five days earlier for new contract. 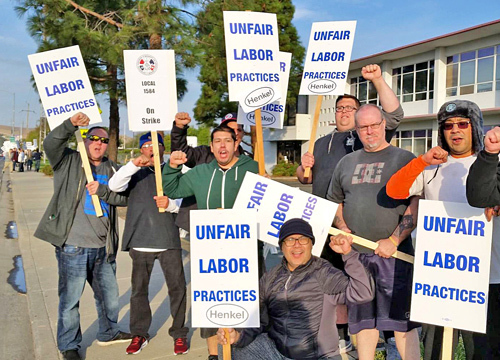 BAY POINT, Calif. — Eighty members of International Association of Machinists Local 1584 in the paste and film department of Henkel Aerospace here went on strike Oct. 16. Safety is at the heart of the fight for a new contract. Over the past six months, several workers have been severely burned by steam. They joined the union and won their first contract after the death in 2013 of David Eleidjian, a temporary worker who had only been on the job a week. His clothing caught on a mixing machine and he was crushed. An Iraq war veteran, Eleidjian was the father of a 3-year-old child. The California Occupational Safety and Health Administration fined Henkel $200,825 for safety violations, and the staffing company $1,500. The company has forced quality control, warehouse workers, temporary agency workers and others to work beside untrained supervisors, operating dangerous equipment. “Please be careful, without the proper training this work can be very dangerous. In the past few years, there have been numerous accidents and even a fatality. We work with all of you every day and we are concerned for your safety,” a union flyer passed out to workers entering the plant reads. Two rallies have been held outside the plant, and United Steelworkers members from the POSCO coil mill nearby hosted a barbecue for strikers. People driving by the picket line have been honking in support. While this correspondent was there, a woman stopped her car and jumped out with bottled water. “I live down the street and want to show my support,” she said as she shook hands with striker Jeremy Albert.